around everything you need. Use it for traveling back and forth to work carrying your shoes, your favourite book or lunch. Don't stop there! Use it as a handbag, hold your knitting or craft. It's big and roomy to fit everything you need. Each tote is either a one of a kind or limited edition using wonderful, designer, decorator weight fabrics - from classic stripes to fabulous florals and everything in between. They are soft structured bags that are lined with a coordinating fabric, have a circular bottom and closes with velcro. When it's not in use it easily folds up and can be tucked away until you need it again. A sophisticated plaid polyester in jewel tones of gold, ruby and navy blue with a contrasting cream lining will take you from day to evening. Spot wash only with a mild detergent and cold water. Get connected when you carry around this tote! This beautiful shade of red has a geometric pattern in shades of green and yellow. The bold multi-coloured veritical stripes in shades of red, yellow and green is perfect for carrying around everything you need. Pretty little roses in shades of pinks and greens on a royal blue background and lined in coordinating green. Sheers are no longer your boring grandma's. Sheers can have colour, texture and pattern. Let us help you get the right drapery on your windows. Contact us now to book a Drapery Consultation! We now have a new drapery hardware supplier that offers the most beautiful satin brass option which is still a popular metal option for 2018! We have new Alendel fabric books in the showroom for you to look and drool over! Email us to book a consultation and we will bring them to your home to find the perfect one to dress your windows. Did you hear? We moved to a new location. Now you can visit us in our showroom and see fabrics, drapery ideas, home decor and more! Did you know that SilverLining Designs can look after all your upholstery needs? Want to update your favourite chair? When hanging your chandelier above your dining room table, if your ceilings are 10 feet or less, hang it 30" - 34" above the table. If your ceilings are higher than 10 feet just add a few extra inches. Every effort has been made to reproduce the exact colours of our products. However, every monitor is different and may vary. 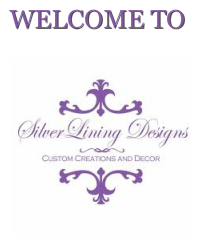 All logos, graphics, images, text, design, and content are copyright protected and the property of SilverLining Designs. © 2018 SilverLining Designs All Rights Reserved.